This Teak Outdoor Club Chair is the perfect respite for relaxation, while still offering the utmost in style and versatility. 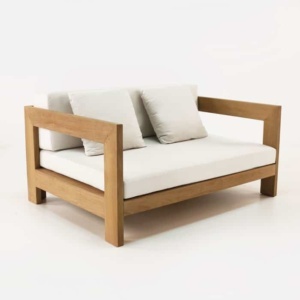 It is beautiful, edgy, clean and modern, with plenty of the honey-coloured premium centre-cut Grade-A Teak wood in it. A bold addition that is sure to steal your heart, this outdoor chair has a lean and sharp style that has a ton of character, but also sticks to a clean design philosophy. 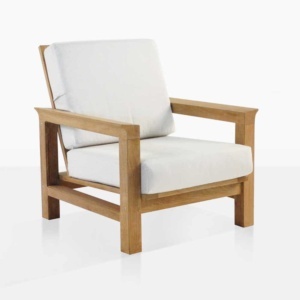 This club chair in Grade-A teak is a customer favourite. The Sunbrella® cushions (as shown) are included in the price. Exemplifying modern living, the Manhattan A-Grade Teak Club Chair is the perfect respite for relaxation, while still offering the utmost in style and versatility. Part of the glamourous, hearty Manhattan Collection; this Teak Club Chair is beautiful, edgy, clean and modern, with plenty of the honey-coloured premium centre-cut Grade-A Teak wood in it. 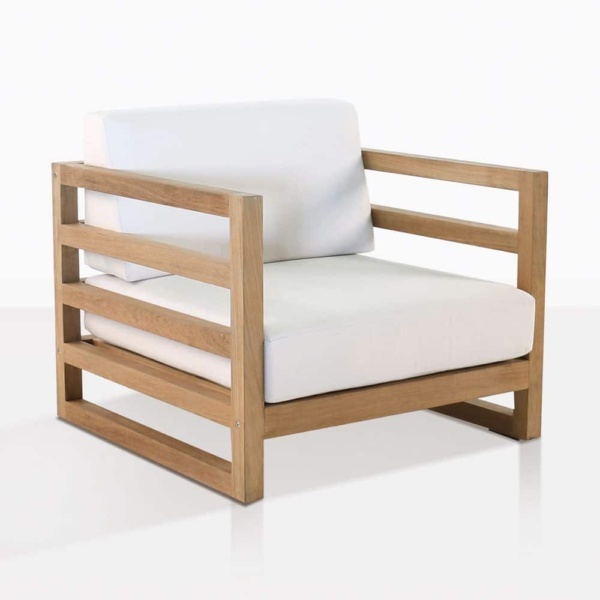 A strong, solid look is captured with the thick 86 by 86 centimetre frame, boasting chunky slats of teak running horizontally across each piece. Though this Manhattan Outdoor Club Chair has ample amounts of wood, it still manages to not fall into the trap of being too heavy-set. 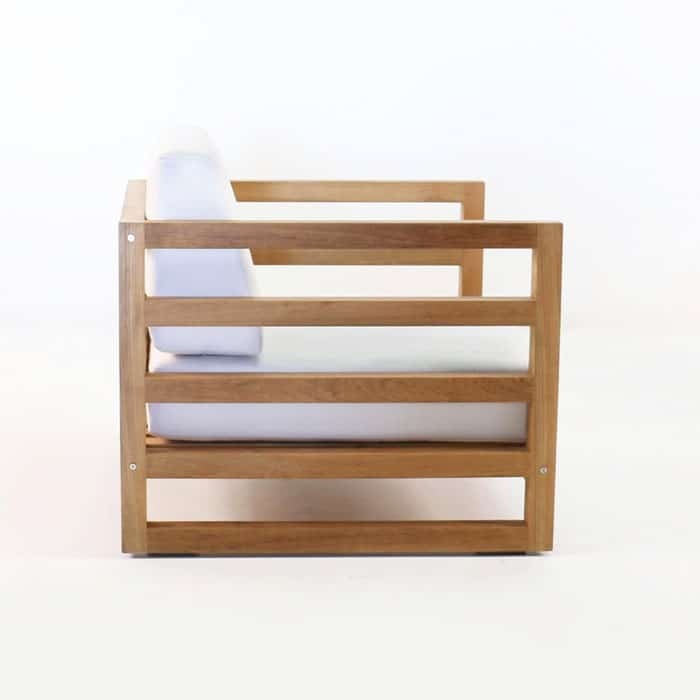 The frame lifts off the ground and the space between each slat give this chair a look that is both satisfyingly sturdy and modern chic! Grade-A Teak has become our ‘majority product’ at Design Warehouse because of its proven longevity and durability in the sometimes harsh New Zealand seasons. ‘A’ is the top grade given as the teak tree has got to at least 40 years old before it is expertly kilned into the strong pieces of wood that make up your outdoor furniture. The ageing process ensures that the teak has had the time to develop lots of oil and natural rubber content, meaning it will weather beautifully and last a long time to come! The Manhattan A-Grade Teak Outdoor Club Chair features free Sunbrella® cushions, each perfectly put together with QuickDry® foam in the interior. You now have a piece of furniture that won’t morph, discolour, fade, or change shape in the elements! 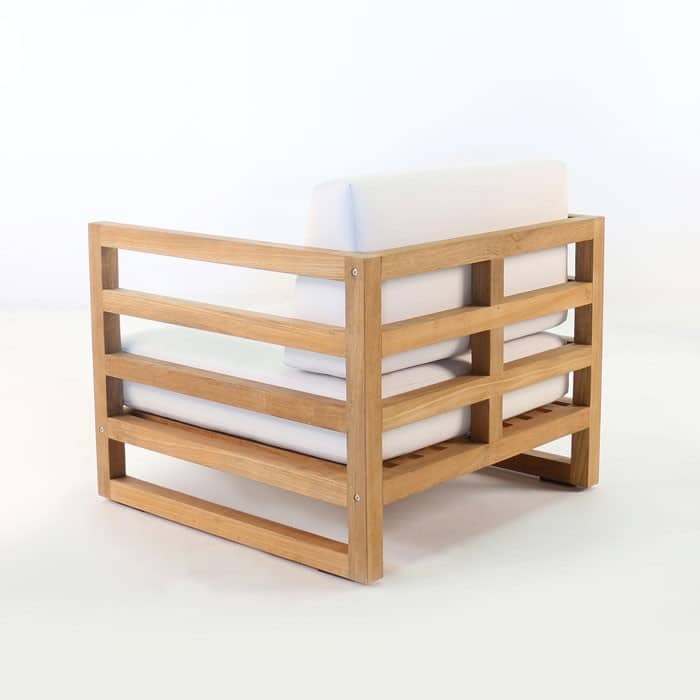 Design Warehouse also has a superb range of other products ideal for outdoor use – choose All Weather Wicker, Raw Concrete, Reclaimed Teak, Mesh Fabrics, Aluminium and even Stainless Steel! We have everything under one roof in our Auckland showroom and on our comprehensive website. So whether you need to shade under an umbrella, lie out on a sunbed, relax in some deep seating or enjoy long lunches with family, we have everything. Call us today to see how we can help you! A bold addition that is sure to steal your heart, this Manhattan A-Grade Teak Club Chair has a lean and sharp style that has a ton of character, but also sticks to a clean design philosophy. The Manhattan teak Club Chair is an excellent choice for a corner of your garden or patio, perfect for curling up with a great book on the weekend. If your deck is in need of some seating, try four of the Manhattan A-Grade Teak Club Chairs around a low round table, or large square raw or Blok concrete. If you love the Manhattan outdoor club chair but are not sure how to fit it into your space, give us a call. Our sales assistants are committed to helping you find something that will suit your style desires without overwhelming the area. We love helping create configurations that you will love for years to come!